For my ‘At the Airport’ column on USA TODAY this month, I traveled to Lexington, Kentucky’s Blue Grass Airport and to Amsterdam’s Schiphol Airport to learn how horses and other animals fly. In Lexington, it was all about horses and Air Horse One, the leased 727-200 aircraft the H.E. “Tex” Sutton Forwarding Company uses to fly valuable race horses and show horses around the country at ticket prices that top out at just shy of $5,000 for a one-way trip. 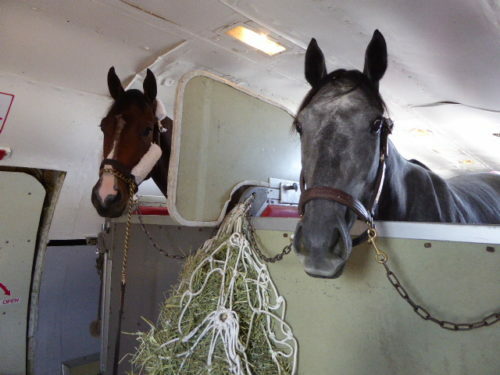 Fed Ex, UPS and large commercial airlines ship horses and other animals as cargo, but Tex Sutton – as the company is commonly known – began ferrying Kentucky Derby winners and other prized horses by air in 1969 and remains the one U.S based horse transportation company that uses a dedicated aircraft to do so. At During my visit to Blue Grass Airport, Mike Payne, Tex Sutton’s operations manager explained that horses flying on the airline make their way between transport trailers and the airplane on custom-built ramps with high walls so that their feet never touch the ground and so there’s little chance of having a horse get loose at the airport. Once on board, horses are loaded into specially built stalls that can be arranged two or three across inside the airplane. While the owners of some “celebrity” horses may charter the entire plane, Air Horse One can carry 18 to 20 horses per flight. Thoroughbreds that have ‘pets,’ such as goats, that help calm them in stalls on the ground can bring their buddies along on the plane – like carry-on luggage – for no extra charge. The same goes for grooms, who travel as animal couriers and get regular seats in the back of the plane. To accommodate their special cargo, the pilots of Air Horse One make wide turns and extra gentle ascents and descents to try to keep the horses from getting spooked or losing their balance. Like air ambulances and Air Force One, at airports around the country Air Horse One often gets preference when it comes time to take off. And while Air Horse One predominantly hauls horses the airline recently transported someone’s 40-pound pet miniature cow and, separately, five dolphins. While Tex Sutton has been hauling horses by air since 1969, all manner of animals have been traveling as cargo on airplanes for much longer. KLM Royal Dutch Airlines was already transporting bees and baby chicks in 1923, but in 1924 the carrier became the first commercial airline to transport a large live animal when it flew Nico, a valuable young stud bull, from Rotterdam to Paris. In 1948, when The Hague was celebrating a major milestone, the Swiss capital of Bern sent two baby bears – via KLM – as a present. Today, KLM has an “Animal Hotel” at Amsterdam’s Schiphol Airport that is billed as one of the world’s largest and most modern such facilities in the world. And while I didn’t see any rhinos or lions during my tour of the animal hotel earlier I did see (and hear) towers of containers filled with one-day old chicks and trailers filled with thoroughbred horses patiently waiting to board their flights.